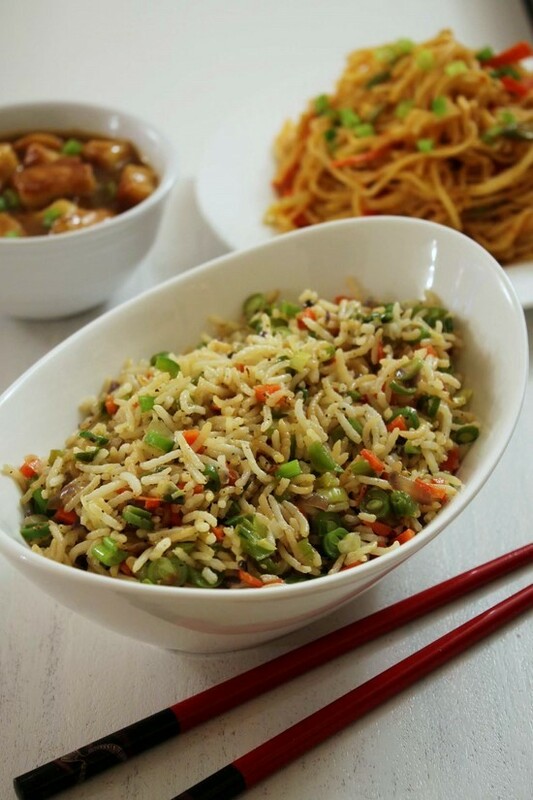 Vegetable fried rice recipe – Most popular fried rice recipe from Indo-Chinese cuisine. Very simple yet delicious veg fried rice. As you know that the chinese meal is not complete without any rice dish (it can be a simple steamed rice). On side gravy dish is served. In Indo-chinese restaurants, taste and spice level may vary from one to another. Many serves spicy veg fried rice, this spicy taste comes from the chilli sauce. I have seen many add red chili powder. But here I have made very less spicy. I have just added a touch of green chilli. I always like milder version of fried rice, so I can have it with spicy or chili-garlic flavored gravy on side. This fried rice is easy to make if you have leftover rice handy. It is best to use a day old rice, as they are drier because stored in refrigerator and rice grains will stay separated after tossing them with veggies. But here I have mentioned ‘how to cook rice’ and that method also gives each and every rice grain separated. So Fresh or old, both will work just fine. 1) First cook the rice by following this method. Use oil instead of ghee while making it for fried rice. Approximately ¾ cup of raw rice will give you 3 cups of cooked rice. Let the rice cool down a little bit.Fluff up the rice and make sure that there are no lumps of cooked rice. 2) Meanwhile do the preparation, chop all the veggies. 3) Heat the sesame oil in a pan or wok on medium-high heat. Once hot add chopped ginger, garlic and green chili. Saute for a minute. 4) Then add chopped onions. 5) Cook till they becomes translucent. 6) Then add rest of the vegetables (beans, carrots, bell pepper, cabbage, green onion). 7) Mix well and cook with stirring frequently as we are cooking it on medium-high heat. 8) Cook for 2-3 minutes, they will start to soften. We don’t want mushy vegetables, they should have crunch in it. 9) Add steamed rice, salt and pepper. 11) Lastly add soy sauce and mix gently till incorporated well. Remove it to a serving bowl. garnish with chopped greens of spring onion. For a variation, You can add or remove the vegetables as per your choice. you can use mushrooms, baby corn, bean sprouts. To add protein here, you can add chopped or crumbled tofu, soya chunks. If you eat eggs, then you can add scrambled egg or chopped hard boiled egg. Serving suggestion: Serve this veg fried rice with any indo-chinese gravy dish e.g. vegetable manchurian, gobi manchurian gravy, chilli paneer, paneer manchurian. First cook the rice. Approximately ¾ cup of raw rice will give you 3 cups of cooked rice. Let the rice cool down a little bit. Fluff up the rice and make sure that there are no lumps of cooked rice. Also chop all the veggies. Heat the sesame oil in a pan or wok on medium-high heat. Once hot add chopped ginger, garlic and green chili. Saute for a minute. Then add chopped onions. Cook till they becomes translucent. Then add rest of the vegetables. Mix well and cook with stirring frequently as we are cooking it on medium-high heat. Cook for 2-3 minutes, they will start to soften. Add steamed rice, salt and pepper. Mix well. Lastly add soy sauce and mix gently till incorporated well. Chinese fried rice recipe is very delicious and i found more recipes in this site i love most of this.